This remodel demolished an existing enclosed and cramped kitchen, and created a new kitchen open to the main living and dining areas and the wonderful view of Lake Washington. Also demolished were existing poorly located stairways between the main floor and lower floor, and between the main floor and the upper floor, replaced by relocated stairs and new fireplace. Many difficult functional and structural problems were solved with what is now such a simple and clear design. 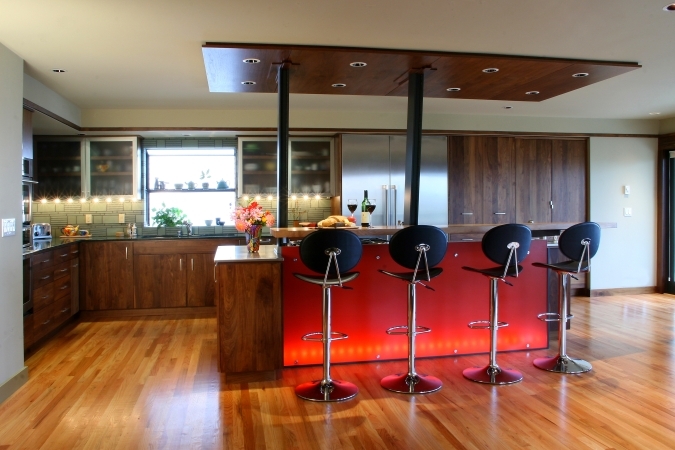 Walnut cabinets and island soffit are custom designed (by Lovegrove Design) and built. The sloped steel columns are the solution to supporting an awkwardly located previous upper floor addition while forming a positive element in the design. The island eating counter is a single piece of elm supported on 3 cantilevered, painted steel brackets integrated into the steel column design. Details throughout are clean and articulated yet rich. The steel and wood open stairway winds to the upper and lower floors behind the new sculptural fireplace masses. The backlit colored resin island panel enhances the warmth and elegant simplicity of the design.